The following text is a free translation of “1 Mayıs'ta cop, gaz ve panzere karşı koyma rehberi” by Onur Erem, published in Birgün newspaper's website on April 30th, 2013. The original Turkish article aims at providing protesters with basic information on how to deal with police violence. >> Health responsible: Being exposed to different physical attacks in protests may cause injuries, asthma crises and similar health problems. The equipment to handle such situations would slow down the protesters, and many may not be able to afford them in the first place. Therefore, choose someone in your group as responsible from health issues. This person should have with her/him basic material such as lemon, water, milk, vinegar, gauntlet and band aids. It is very important that this person does not confront the police and waits at a distance to the conflict, so that s/he is not detained with all your equipment. When exposed to teargas, use eye drops, water and milk to clean your eyes. To reduce the effects into minimum, cover your nose with a piece of cloth (or some cheap sterile mask you can find in pharmacies) that you submerged into lemon juice or vinegar. (Lemon and vinegar are acidic, whereas the teargas is basic. They eliminate each other.) You can apply the vinegar to all the parts of your skin that are exposed to direct air. Also, using goggles or swim masks would significantly reduce the negative effects on your eyes. This is especially important for people who use contact lenses. Windy weather conditions reduce the effect of teargas. If you manage to take the wind to your behind, this would result in teargas going back to the police. If the teargas was not sprayed but shot as a capsule, protect your hand with a thick cloth/glove, take the capsule and throw it back to the police. It is essential that your cloth or glove is not plastic. Plastic material can melt and stick into your hand. Finally, it is a better idea not to take a shower before the protest. You can let your pores close by not taking a shower as long as you can before a protest. This would reduce the negative effects of teargas in your body. >> Steel baton – stun baton: The cops may have different batons for different purposes. In addition to the classic baton that we are familiar with, there are new varieties such as the expandable baton which suddenly expands from a 15 cm stick to a 50 cm club, and the stun baton which administer an electric shock on the target. There are several ways to avoid batons. First, have put protective clothes on. You can further reduce the impact by covering your body with plastic bottles, camping mats etc., or by having life jackets on. Having protective helmets on may help as well, and not only from batons but also from teargas capsules. Another way to protect yourself from batons is to use a shield. Lids of waste containers and many other plastic and/or metal material you can find on the street are in fact good enough to protect you from major injuries. If you are a large group, an acrylic glass board make it possible for you to block the batons, stop the cops, and even to disarm some of them by jamming them into a corner. This material (the acrylic glass, or more correctly Pleksiglas) is commonly used all around the world to protect protesters from being dispersed by the police. In order to hold it strongly, you must produce handles on your side. Instead of acrylic glass, you can also use big tractor tyres. >> The water cannon: The acrylic glass boards and shields mentioned above can also be used to withstand the water cannons. If you don't have any of these materials, you can try to lead the water cannon into a small street by following you. 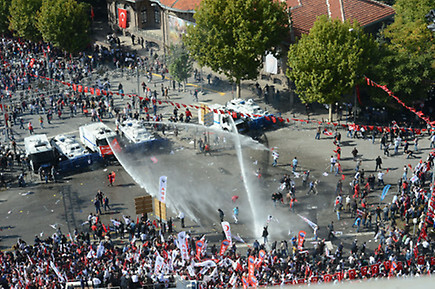 Once it enters the narrow streets, the water cannon loses its maneuver possibilities. Either it takes the risk and you neutralize one watter cannon, or it doesn't and you got over it. >> Action photographer/cameraman: It is important that several protesters take photos or video recordings in order to document illegal acts of the police. 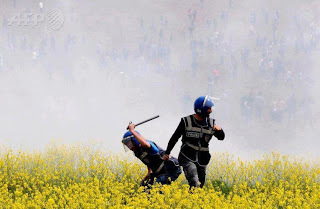 As mainstream media generally watches the situation behind the police and from a long distance, if protesters take photos during the action, many illegal practices (such as direct exposition of teargas to the face) can be documented. For those who take this responsibility, we advise to switch off face detection and similar properties, that could reduce the speed of the camera and therefore make you lose very precious seconds. Automatic focus and automatic iso modes, on the other hand, ease the work because everyone is moving. Instead of looking at the photos taken, we advise to leave it to the end of the protest, in order not to lose important scenes. If you suppose the protest to take a long time, not keeping the resolution at the highest level is a good idea so that the memory card would not be full in the middle of the protest.